First Visit to the Cost Calculator? You can browse all the equipment items in the Cost Calculator and review their capital costs and operating costs by clicking on the appropriate tab at the top right on your screen, and then clicking on the equipment type of interest. Clicking on the "All Equipment" tab provides a listing of all the equipment types in the Cost Calculator. Clicking on the "Surface", "Underground", "Milling", or "Miscellaneous" tabs provides access only to the types of equipment identified by the tabs. Before you can create an equipment list (inventory) and make any adjustments to the equipment costs, you must create a project. If the Cost Calculator doesn’t open to the "My Projects" screen upon log in, move to that screen by clicking "My Projects" near the upper right corner of your screen. 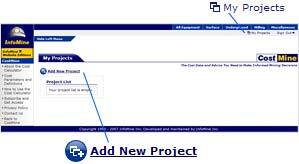 .Click "Add New Project", give your project a name and provide further information if desired. You must save your project at this time, then open the project to prepare to create your inventory. You can change projects at any time by returning to the "My Projects" screen and either opening an existing project or creating a new one. After you create, save and open a project in step 2, then begin to build your inventory by finding the desired equipment item from the equipment indexes "All Equipment", "Surface", "Underground", "Milling" or "Miscellaneous" at the upper right corner of your screen. Specify the number of units needed, then click on "Add to Inventory". The specified items will be added to the Inventory for your project. If the "number of units" column is empty when you browse the equipment list, it means you have not created or selected a project to accept the equipment inventory. Select or create your project first, then build your inventory. You can change the number of units for an item in your inventory by clicking the icon. When the "Equipment Adjustors" screen appears, change the number of units, then click "Apply Adjustors", and then click "Inventory" to return to your inventory and see the change in number of units. Users can now adjust the unit costs to reflect local economies. From the Inventory page click on “Edit Currency/Units. Here you can change from U.S. Standard units to metric units, change currency and change individual unit costs to reflect the local economy. Once you have edited the units and currency, save the changes and then return to the inventory. When the user has changed the currency and exchange rate the new currency will be displayed on the Inventory page and the exchange rate will be applied to the capital costs and hourly operating costs that are dependent on capital costs. The unit costs will remain the same until changed by the user. Note: once you change the currency, it is up to the user to manually replace the default value. From the Inventory list, move to the "Equipment Adjustors" screen by clicking the icon (adjust quantity icon) for any item. Here you can apply a cost adjustor to adjust any of the costs for project operating conditions or local economics that differ from those assumed for the Cost Calculator. These adjustors can also be used to adjust for operating conditions that may be more or less difficult than the average conditions assumed by the Cost Calculator. "Apply Adjustors" must be clicked before the adjusted cost will be calculated. If you wish to apply an adjustor to all of the equipment of a particular type in your inventory (e.g. all wheel loaders), click "Apply to Type". 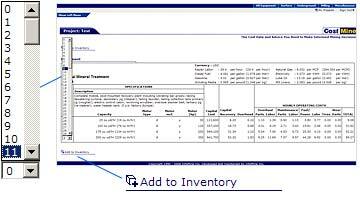 From the "Equipment Adjustors" screen click "Inventory" to return to your equipment list, now showing adjusted costs. If you wish to apply the same adjustor to other equipment types in your inventory, you must apply the adjustor to each type separately. From the Inventory screen you can produce a report of Capital Costs by clicking on "Capital Costs Report". To print your capital costs report, highlight and print the appropriate portion of the report screen using Windows’ print function. To do this, first paint the portion of the screen you want to print, then right click on the highlighted area and select "print" from the drop down menu. Check "Selection" for the print range in the Print window. If you wish to print the report in a different format, export the report to Excel and create your own format. 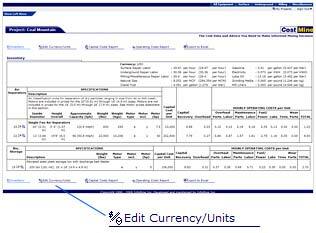 Click on "Operating Costs Report" to produce a report of item by item capital and operating costs. To print your operating costs report, use the procedure described above for printing the capital costs report. Either report can be exported to Excel by clicking on "Export to Excel". Here the data can be manipulated as desired, i.e. the hourly operating costs can be multiplied by the number of operating hours per day to determine daily costs. 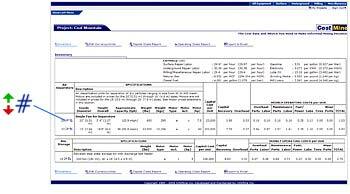 Also, the reports can be custom formatted for company-specific needs. You saved your project when you first created it, and subsequent additions and changes to the project have been saved automatically, so no further action is required to save your work. Your projects will be available to you the next time you log into the Cost Calculator.